Who can imagine translating the typical traditions of a Lebanese wedding in the Florentine countryside? This mission is possible thanks to the support of professional figures and high-level wedding planners, who are able to transfer the requests of the married couple with respect and good taste. The Lebanese traditions are known for their splendor and wonder. Lebanese culture is among the most quoted in the environments of the Christian Catholic tradition. Just think of some of the most widespread liturgical Italian songs during weddings, where the lyrics quote: “Come from Lebanon my wife, come from Lebanon, come. We will go to dawn in the vineyards, we will reap the benefits”. Countless videos on YouTube show how weddings in Italy sing about the stories handed down over the centuries of marriages in Lebanon, including the video that has become viral for over a million views, a young couple who intoned the song “Come from Lebanon”. Combining Lebanese traditions with Italian ones, and specifically with the Medicean environments of Villa Corsini in Mezzomonte and the surrounding countryside, was not a simple mission. Corsini.Events Group’s Team has worked perfectly to organize a Lebanese wedding that respects and sublimates every characteristic element of a celebration different from the others. Tradition and modernity have found the perfect fusion: between Lebanese dancers celebrating the spouses and fireworks that would decree the end of a day of celebrations and the beginning of a life together. 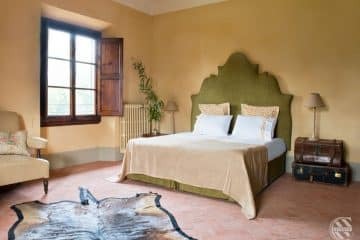 Of course, knowing how to combine the sweetness of the Tuscan countryside with the Lebanese culture and the traditions of the Region was not immediate. The importance of the details, the care and the respect for every detail have made the ceremony successful: from the wedding menu to the wedding cake, through the floral arrangement and the bride’s make-up. Each element was a witness to research and the achievement of perfection. Organizing a multicultural marriage is not a simple task: but thanks to the wedding planners and the Corsini.Events Group team, every effort has been rewarded, for a thousand and one nights’ fable. "Come out of the country, let us dwell in the villages. We will go to dawn in the vineyards, we will reap the rewards".